Now that you've learned how to customize the templates and where to find them, let's make a small test modification. 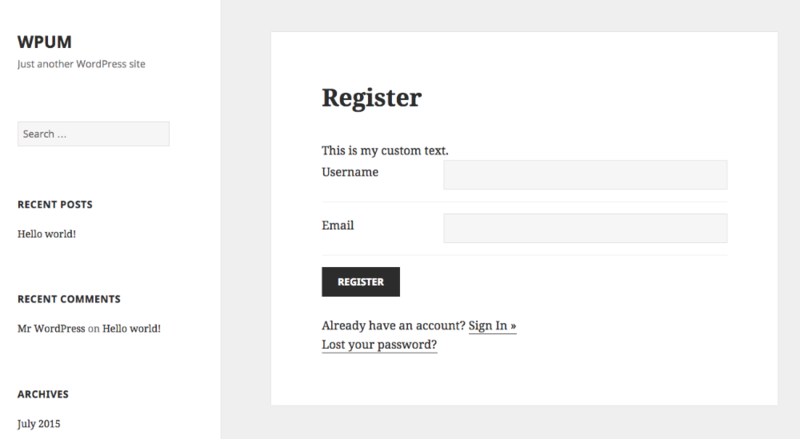 In this example we will add some custom text above the registration form. Remember this is just a very simple example, custom text can obviously be added through the WordPress page editor. You will notice files and sub folders. The registration form template file can be found into the subfolder " forms". Create a new folder called " wpum" if it does not exist. Because the registration-form.php file was into a subfolder called " forms" - you must create a new folder called " forms" into your " wpum" folder. Save the file and visit your registration page ( remember the registration form is visible only when NOT logged in ) and if you've done everything correctly, you will see your custom phrase on top of the form.